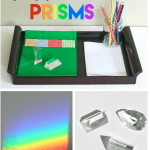 Make a homemade spectroscope with a few simple materials and explore the spectrum of different light sources. 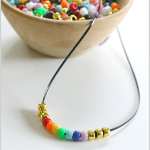 You’ll see all kinds of rainbows! 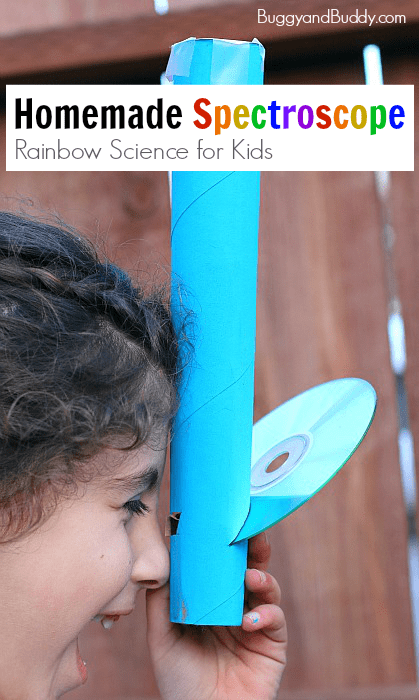 This science activity for kids makes a great addition to a unit on light or weather and is perfect for St. Patrick’s Day too! 2. 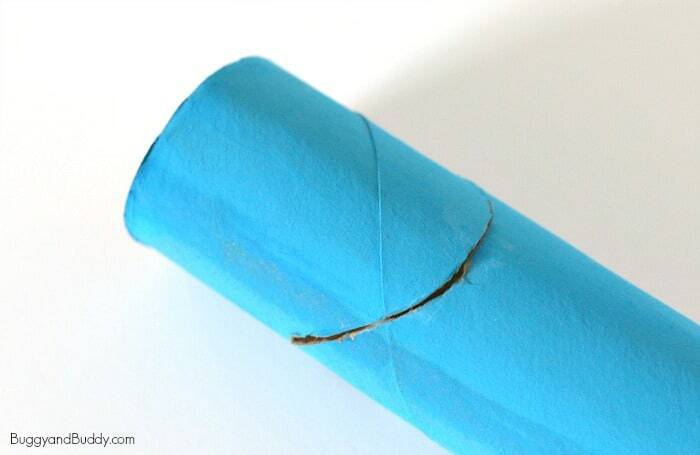 Use a craft knife (an adult should do this) to cut a thin slit at a 45° angle toward the bottom of the cardboard tube. 3. Directly across from the slit, make a small peephole or viewing hole using your craft knife (another step for an adult). 4. 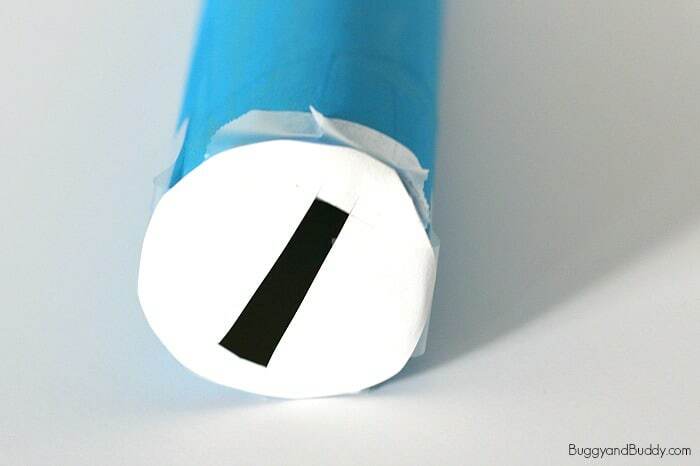 Trace one end of your paper towel roll onto your small scrap of cardboard or cardstock. Cut it out. 5. 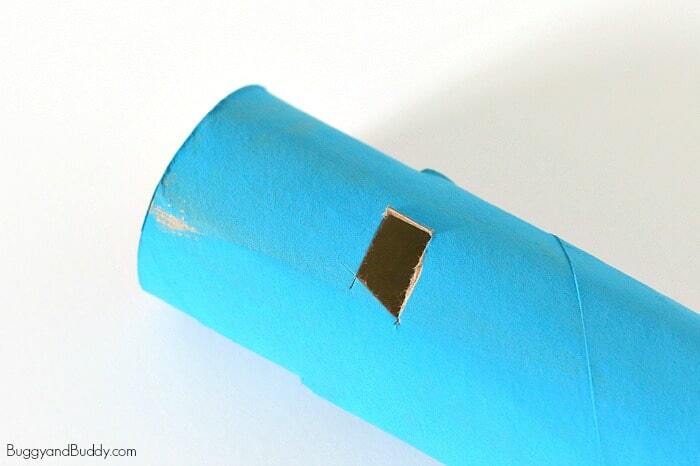 Cut a straight slit right across the center of your cardboard circle. 6. 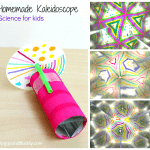 Tape the circle to the top of your spectroscope. 7. Insert the CD into your 45° angled slit with the shiny side facing up. Start by taking your spectroscope outside. Point the top slit up at the sky (NOT directly at the sun). Look through the peephole. You will see a rainbow inside! 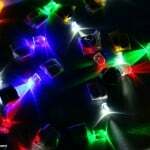 Now try your spectroscope with other light sources like fluorescent light, neon light and candle light. Compare what you see! A CD is a mirrored surface with spiral tracks or pits. These tracks are evenly spaced and diffract light (separating the colors). 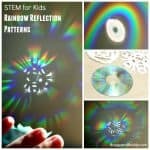 Because the CD’s surface is mirrored, the light is reflected to your eye. 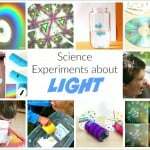 See More Science Activities Here! 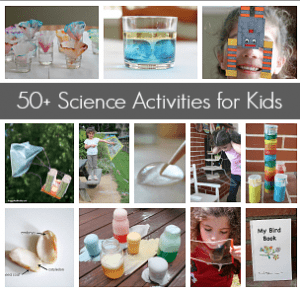 Be sure to check out all our science activities for kids! All I can say is that this is very cool! This will be so much fun to try. I’m curious to see how the rainbow changes with the different light sources. Thanks so much for this fantastic idea! This is so neat! Thank you for sharing the instructions. We’re doing a lesson on light next week, so this was perfect timing! So great! Do you think this would work with a tp tube too? Hi– did this work with a toilet paper roll?? Thanks! 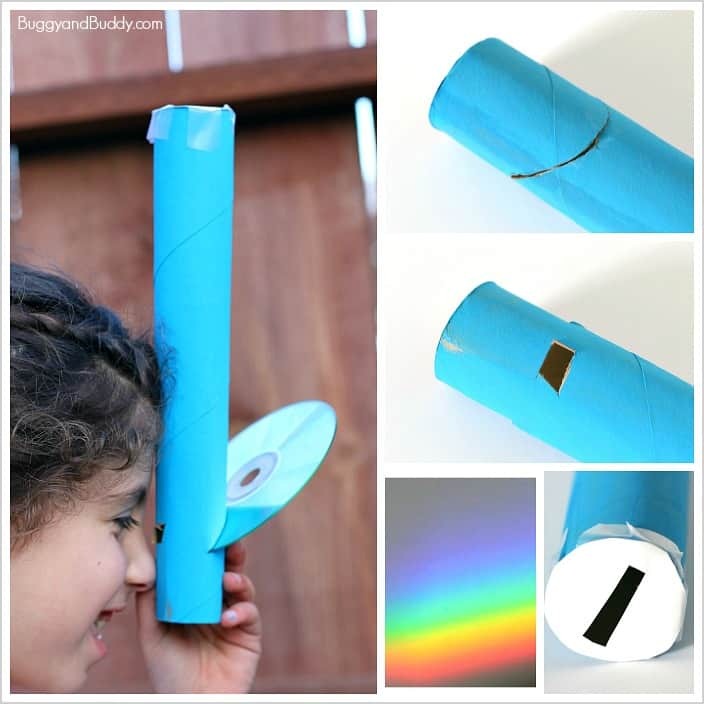 I just tried it with a toilet paper tube, and I was able to see a rainbow on the cd. It was a little awkward holding it, but it seemed to work alright! I’m excited because I can’t find paper towel size craft tubes (I haven’t not been preparing!! ), but I can easily buy the smaller ones! 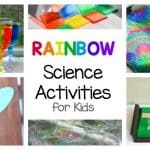 Rainbow Science Birthday party here we come! 😉 Thanks for the great ideas! How creative! And what a great use for old CD’s, too! 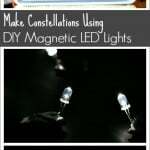 This is a super cool project. 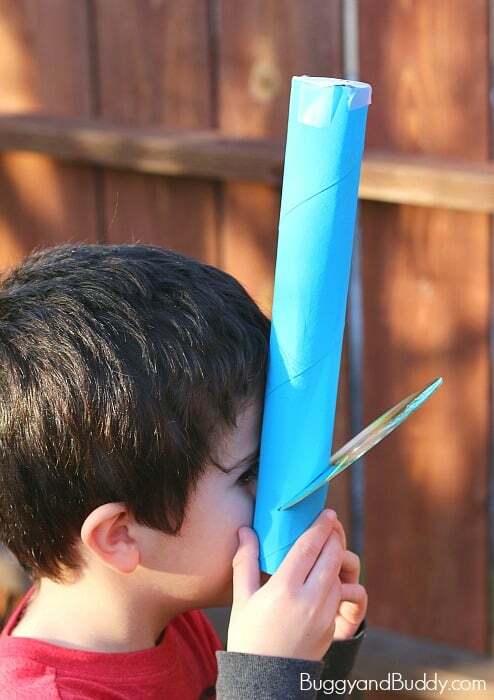 This would be a great project to teach students about mirrors and how objects reflect. Hi, Wouldn’t this damage the eyes? Thank you so much for this important reminder. This is not dangerous to the eyes, as long as you do NOT directly look at the sun. The rays are not being reflected into your eyes, but against a surface that you are looking at. You’re receiving the same amount of rays as you would just going outside to play or take a walk. did not work the way I expected, but it worked.